Geek Latte | Taking the "insta" out of Instagram? These last couple of days, my instragram feed has become saturated with accounts telling me that I need to turn on my notifications for them or otherwise, I will no longer see their pictures. There has been widespread panicked that Instagram is changing its algorithm and the feed would no longer be chronological. Instead, pictures of accounts you like most will be prioritized at the top. But is it true? Are the changes taking place "tomorrow," so we must all turn on notifications immediately for the accounts we follow? Turns out, things got blown out of proportion and everyone just panicked!!!! Instagram announced on Monday, March 28th in response to the frenzy of posts complaining about the changes --> "We're listening and we assure you nothing is changing with your feed right now. We promise to let you know when changes roll out broadly." Also, imagine turning on notifications for every account you follow. I personally get plenty of emails, texts, calls and messages throughout the day and do not need my phone to be buzzing each time someone posts a picture of their morning latte or captured the perfect flatlay. I am pretty certain that everyone who has turned on notifications will shortly after turn off the notifications because your device is going to be going off every moment of the day! So instagram may still be taking out the "insta" from the app in the future; however, rest assured, your posts will not magically "disappear" from people's feeds! Followers who engage more on your account will see your posts near the top of their feeds. Others will just see it more down the feed. Personally, I hope instagram does NOT change the algorithm because I prefer the chronological order. I follow a large array of accounts and like the variation in my feed. It would be kind of weird for example to have a several pictures by one account dominate my feed and also, I would miss out on awesome pictures from others! However, since it is still unclear when or if a change like this might occur on instagram, I suggest giving love to the accounts you really enjoy in your feed. Take the two seconds to heart the image you actually like versus mindlessly thumbing through your feed. Also, leave a comment every now and then on a picture you really like! The Conclusion: Do not beg your followers to turn on their notification on your account because it might just be a surefire way of getting unfollowed in the near future! There are No confirmed changes happening on Instagram, but in the mean time, do show some love to the pictures you really love in your feed! Hope this helped you all! I am actually really excited to share this with you because I am absolutely flattered that Tokidoki - the company itself - sent me goodies in the mail! I practically screamed when they emailed me. For those of you unfamiliar with the brand Tokidoki, it is a Los Angeles based company. All of the designs are by italian artist Simone Legno! As always, Tokidoki's blind box graphics are gorgeous and well thought out. Inside, the figures were sealed in Tokidoki's iconic printed silver bags. I actually like the fact that the figures are double blind, so after opening the box, the anticipation only increases because you still do not know what figure you got! 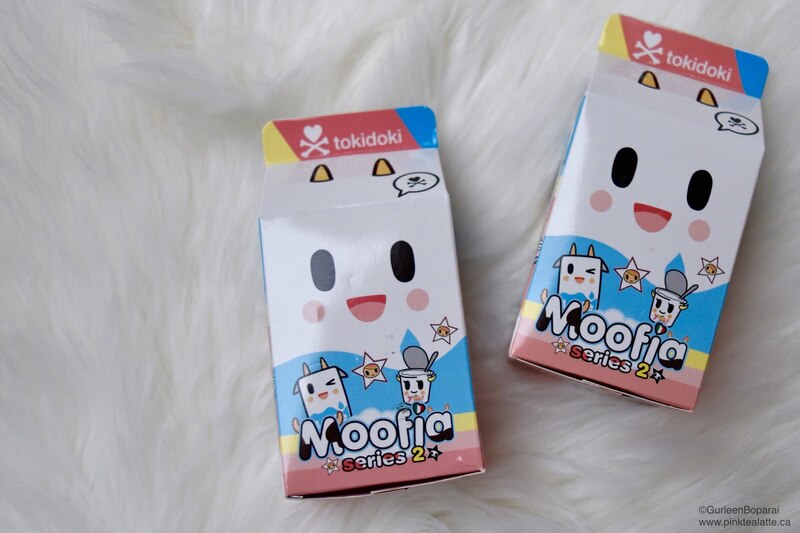 Starting with Moofia Series 2 because it is my favourite collection by Tokidoki. There are a total of 10 figures to collect, Coco-Latte being the chaser (1 in 50 chance of getting). The figures I want are Latte - no duh - , Moo Moo and Peachy Momo! 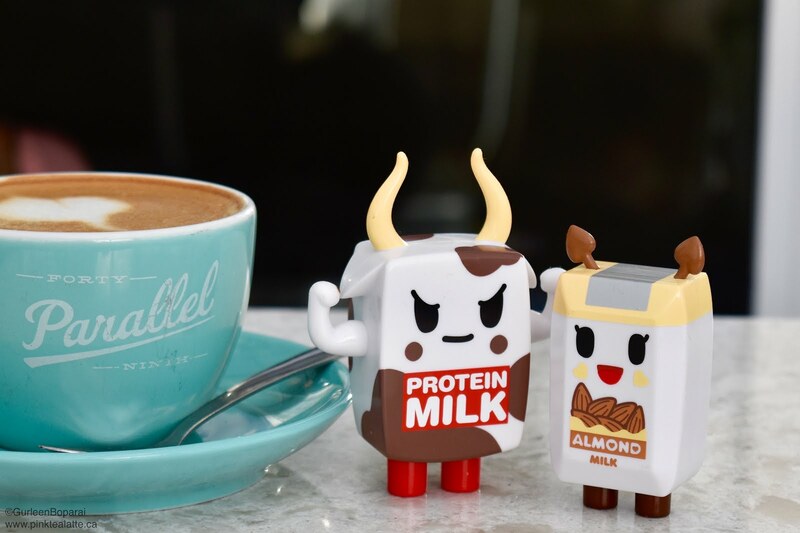 From the four blind boxes, I unboxed two Herbies (the organic milk), Muscles and finally Moo Moo! I was bummed that I got a double especially since there were only four blind boxes. But Moo Moo definitely makes up for it! 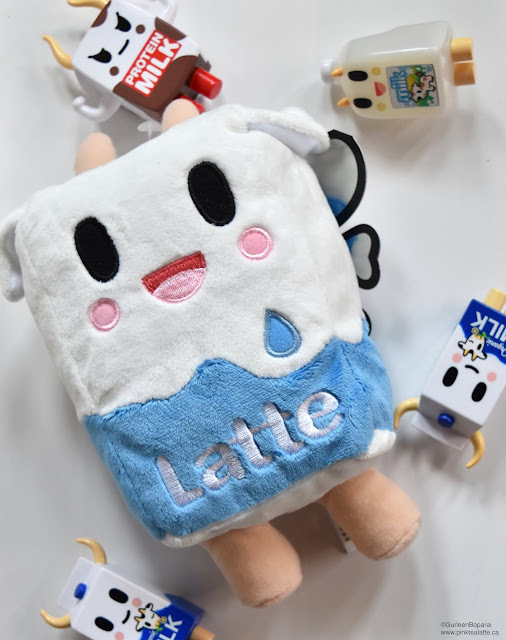 The little 4L jug design is so darn cute and I love the fact that he is a semi translucent creamy looking figure. They did a fabulous job getting the look of a real 4L jug! And muscles, oh I am in love with your strong biceps hehe The figures are of high quality with a really good paint job. My figures do not have any paint smudges or marks. 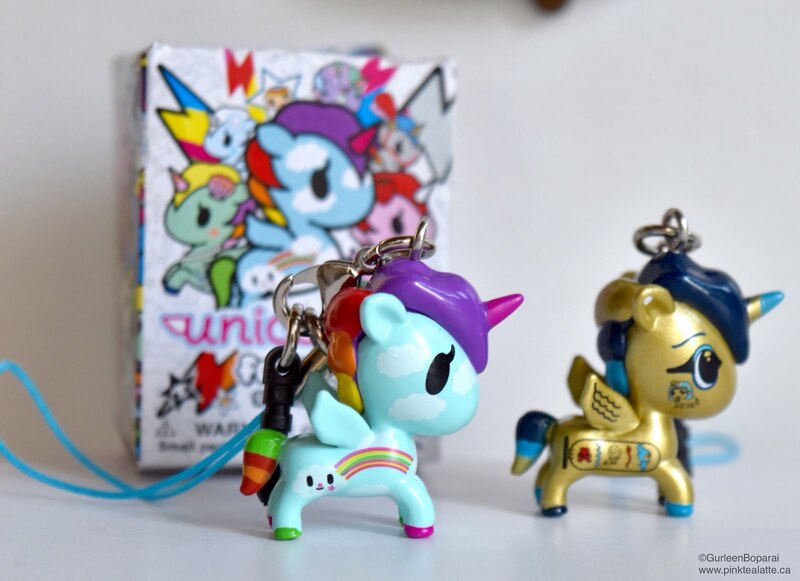 The Tokidoki Unicorno Frenzies collection is really cute and I was really happy that they sent me four to unbox from series 2! For such a small figure, the quality is amazing and the paint job is on point!!! I got really lucky and unboxed four new figures out of the 12 to collect. I am uncertain if there is a chaser figure for this collection. If you know, please let me know in the comments below! I unboxed Pixie, Cleo, Cornetto and Scooter! 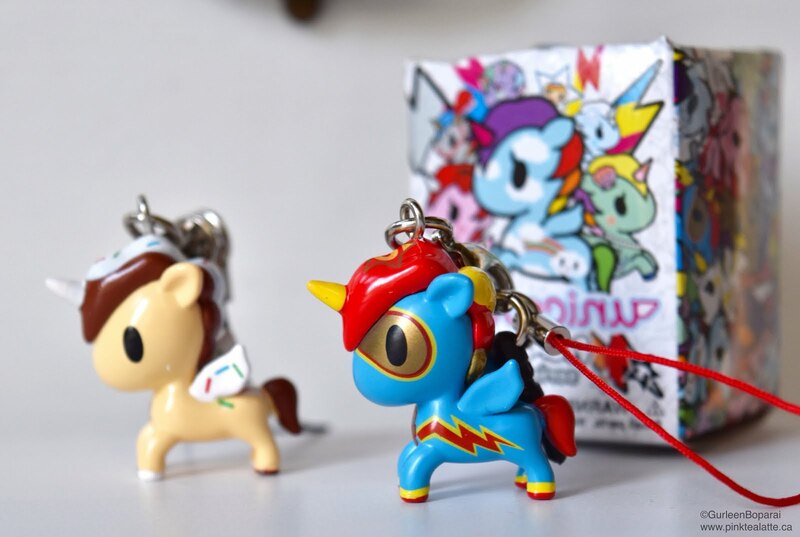 Out of the four, Scooter is probably my favourite because he is a cool super hero unicorno!!! I was hoping to unbox Sirena, but that is the fun of getting blind boxes. I did make a video of me unboxing the figures, but I had some trouble with my camera so the video is not that great. Not to mention that my camera died near the end... whoops, I definitely need to charge it more often. I have not decided if I am going to post the video or not just because I am not happy with how it turned out. You can even tell in the video that was I getting a little stressed that things were not going smoothly. So if you really want to watch it, then let me know in the comments below! Hope you enjoyed this review. Super stoked about the little MooMoo figure. He is probably the coolest vinyl figure ever! 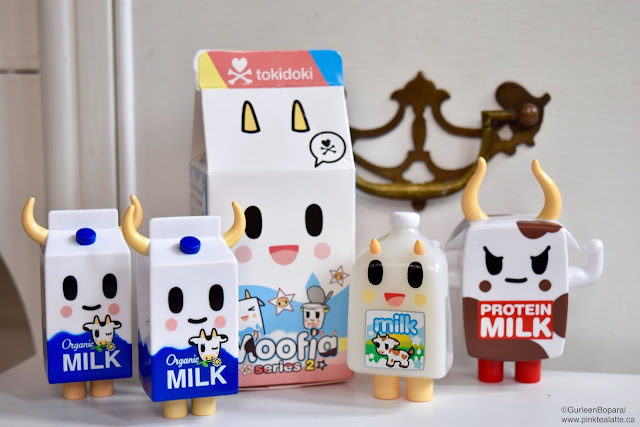 Disclaimer: The items in this post were sent to me by Tokidoki; however, all opinions in this post are completely my own and are not biased by Tokidoki. 1. Long hair takes eons to dry. By the time it does dry, the event has ended and everyone has long gone home and are asleep in bed. 2. It gets in the way! Am I the only one who manages to get her hair stuck while zipping their jacket? 3. When you have dark hair, it attracts more heat, so long dark hair means you are sweltering under your locks. 4. Shampoo and Conditioner seems to run out far too quick. 5. Straightening long hair, girl you are going to be standing in front of that bathroom mirror for an hour. 6. I do not like having my hair up in a pony tail because it makes my head sore. I am so weird, I know. So when I am trying to study, your long hair is going to be getting in your line of vision. 7. You practically look like every other girl. Long hair is the norm. Especially the long wavy hair or long pin straight hair. Why blend in with the crowd? This is LONG hair for me! The only person I trust with having scissors near my hair is Sam! I have been going to Sam for over 3 years and I could not be anymore happier! I was introduced to Sam at a salon I had been going to for years. Ah it was perfect! Sam totally gets me! However, the salon was quite rigid and it did not vibe with Sam so she made the decision to become a barber at University Barbershop. I am so glad that she did because it is as if she was destined to work there. And because I did not feel comfortable entrusting another with my hair, so Sam now cuts my hair at the Barbershop. Not gonna lie, I feel pretty cool getting my hair cut there! As well, how convenient is it that University Barbershop is at UBC's Westbrook Village?!?! Sam has been doing hair professionally for over 3 years now and she is one of the sweetest most easy going people I know. Any day of the week, you can expect to find her smiling while rocking her fabulous coloured hair. I have seen her with sea green to lilac coloured hair and she always, without a fail, manages to pull it off effortlessly! 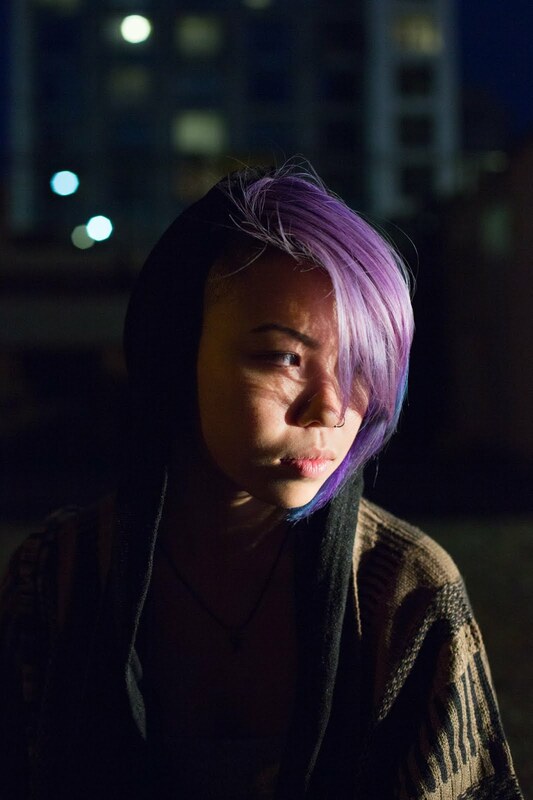 Seriously, hair goals! She maybe tiny, but is fabulously fierce, rocking her combat boots and crystal necklaces on the daily. So what is my go to style? I think Sam can explain it best! 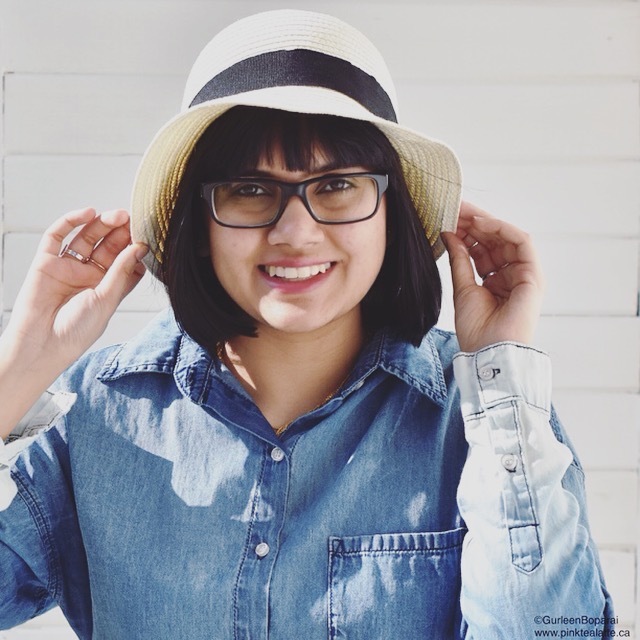 "The blunt, above the shoulder one length bob suits her bubbly, girly and all around fun personality. Of course, mixed in with a bit of edginess for Gurleen's overall style"
I could not have said it better. I wanted chic, I wanted sharp and I wanted it to be simple. Sam delivered exactly just that. You do not need a shaved side to stand out. Anything other then the "norm" go to girl's long wavy hair style is going to keep you looking like a fashionista. Sam also gives me lots and lots of layers because I do have a lot of hair! By thinning it out, the style frames my face better. Plus, shorter hair is so much easier to maintain and you are using far less hair product. I use Bumble and Bumble Gentle Shampoo so I always want it to last as long s possible! It is pricey! Also, styling is a breeze. I only need to run the straightener through once because my hair naturally lays quite straight. If you are wanting a new look and a change from the norm, definitely go visit Sam because I promise she will not disappoint! And be sure to check out her instagram @snipsbysam to see her amazing work. 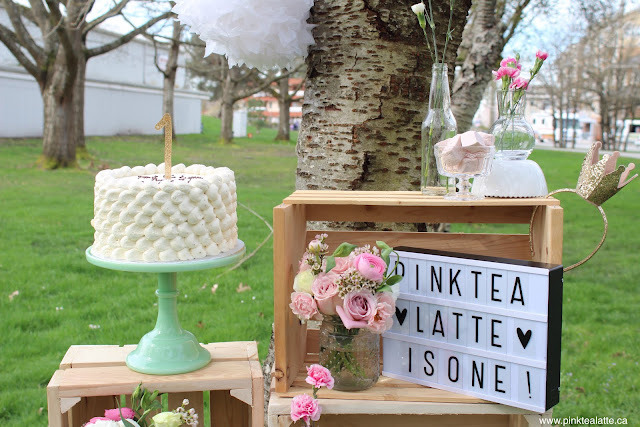 Latte Moment | Pink Tea Latte Birthday Shoot Setup + Inspiration! I am going to break up the details on the photoshoot into a few posts so they do not get too long! This post is going to be all about setting up the display and the inspiration behind it! Before organizing the shoot, I needed to figure out the theme! My favourite place for inspiration has got to be Pinterest. Whenever I need some fun new ideas, I always head on over to Pinterest and save all the pictures I like to a board. That way, whenever I need to refer back to the pictures, I can easily find them in one place. 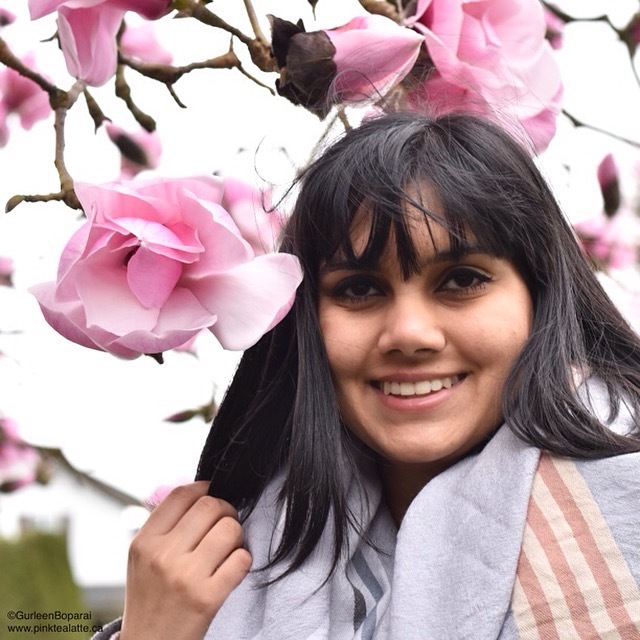 For this shoot, the words that came to my mind were: Spring, Happy, Sunshine, Cherry Blossoms and Free Spirited. 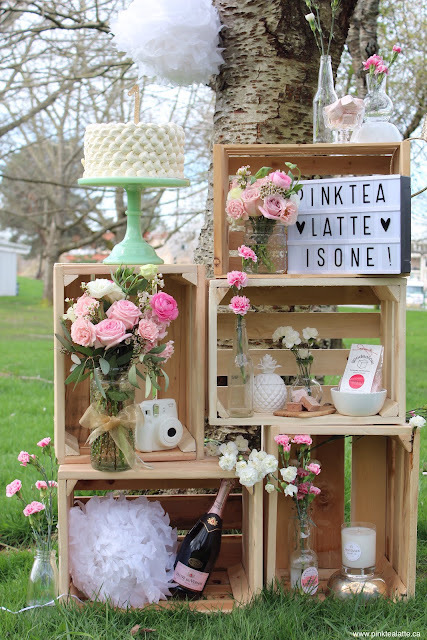 I also already knew I wanted to set it up under a tree and use wooden crates as the surface to display items. Pinterest gave me some wonderful ideas and I started sketching out how I want the crates arranged and what kind of items I want to fill them with. My goal with these pictures is to make people genuinely smile when they see them! If I can put together this setup, I promise you can too! Keep things simple and have fun with it! 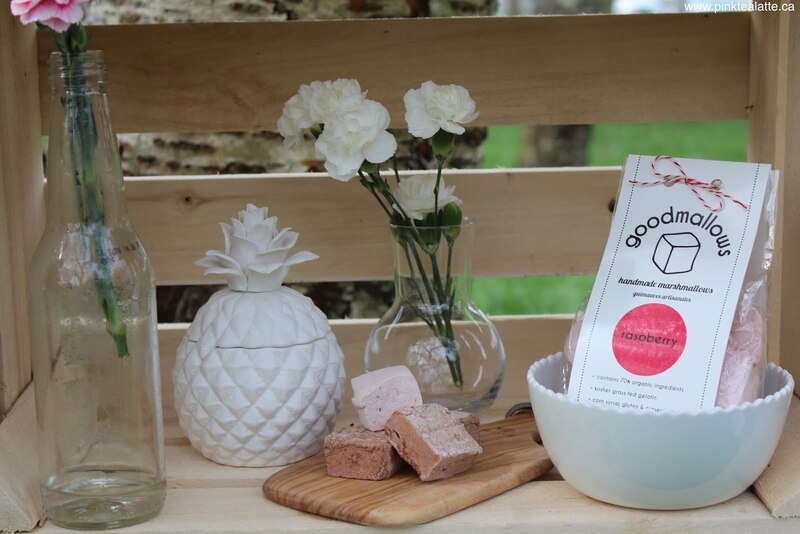 The raspberry marshmallows from Goodmallows are amazing! You can practically taste fresh raspberry in each cube! Four of the five crates, my dad and I built ourselves! Hehe and it cost me literally zero dollars!!! YAY! Success! I might do a blog post on how I made them in the future.The fifth crate I bought from Home Depot for $10. We used it as our model for building the other four crates. They turned out amazing, and honestly, because they are home made, they are not perfect. And that is how crates should be! They have a rustic charm to them and look like I bought them from an apple orchard. The full setup! Love how it came together! 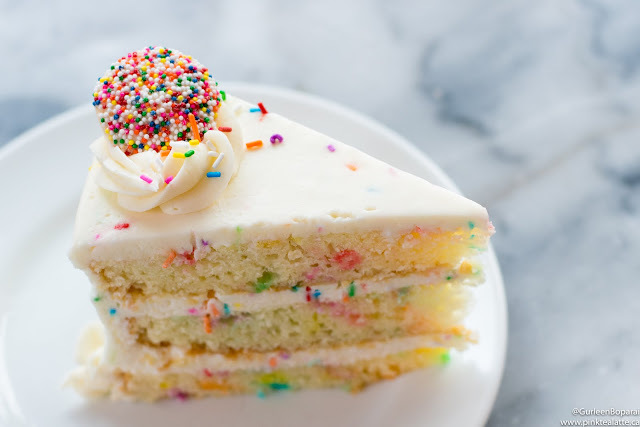 No birthday is complete without a cake. Cadeaux Bakery made me a gorgeous 8 inch cake with a petal frosting design. This delicious cake was decadent layers of vanilla sponge soaked in Earl grey tea syrup with alternating layers of white chocolate mousse and passion fruit swirled chantilly cream. I topped it with a sparkly gold "1." We have already polished off half of this cake and it will probably be gone in another day or two! The cake sat on top of a 10 inch diameter green milk glass cake stand from Cross Designs. 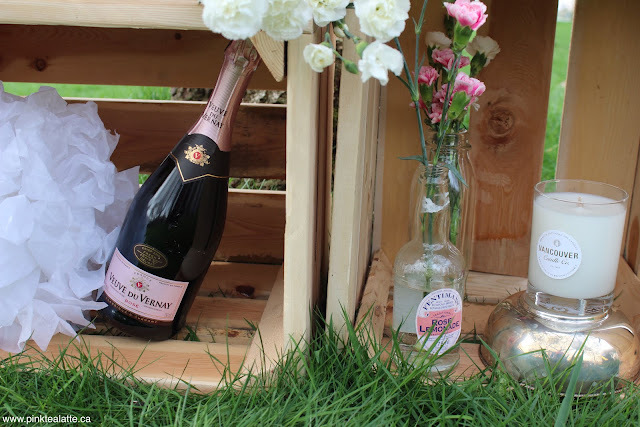 I wanted lots and lots of flowers to fill the crates. Balconi Floral Design Studio did two arrangements of spring roses, full sized roses, pink ranunculus' and greens. I also grabbed a bundle each of pink and white carnations and scattered them throughout the display in random glass bottles. Threw in a few Avalon milk bottles because we all know I am obsessed with their chocolate milk hehe. A bottle of pink bubbly and my favourite candle from Vancouver Candle Co. And the bottles from Fentaman's are so cute! Lastly, other small items like Goodmallow's delicious raspberry and chocolate marshmallows. My Fujifilm instax camera was in there, a bottle of rose and a Vancouver Candle Co candle. Also hung a few white puffy paper balls from the tree! Plus, I cannot forget thee awesome Light Box in A4 size I got from London Field Shoppe! Completely obsessed with it. Honestly, this display could not have come together any better then it did. This setup was exactly what I was going for. It was fresh and so much fun to set up. I cannot wait to share the rest of the pictures from this shoot with you! I had so much fun during it and so glad that I did it! 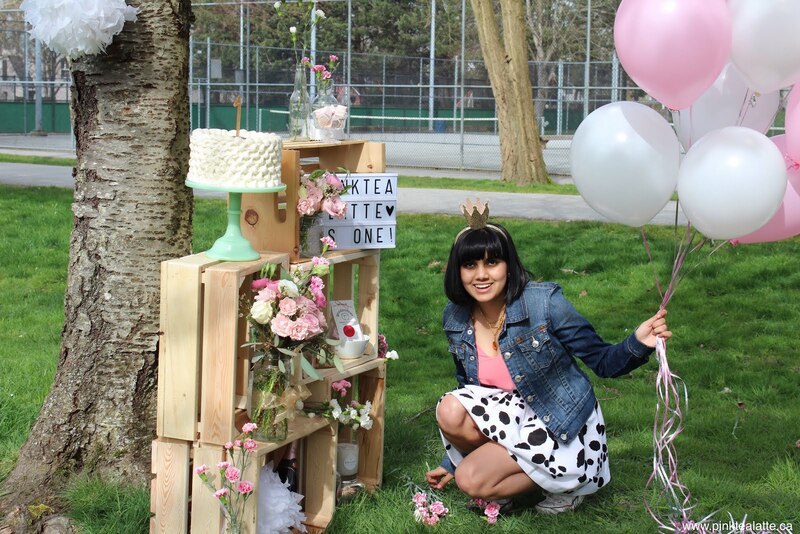 Do look out for my post on the outfit I wore for Pink Tea Latte's 1 year Birthday shoot as well as hair and makeup. Also, would love to know in the comments below if love the pictures from this shoot as much I do! All pictures in this post were taken by my fabulous friend Ruby Bird. I am so incredibly ecstatic right now. I began my blog, Pink Tea Latte, on March 16th, 2015. 366 days later (as we had a leap year hehe) Pink Tea Latte has reached the big 1 year milestone! I honestly cannot believe it! This journey has been incredible and it would not have been possible without the support of all you wonderful readers. I cannot believe all the wonderful and exciting things that have occurred over the course of a year. WOW! Like holy moly! I literally felt like I had accomplished the greatest thing ever by getting my own business cards haha. As well, learning how to graphic design?! Who knew I would discover the world of Adobe Design Suite and also purchasing my very own DSLR Camera + a lens. Absolutely shocking how much I have grown as an individual and it is remarkable how diverse I have become over the course of a single year. I also never imagined in a million years I would take up writing, let alone being a published writer.... MIND BLOWN! Absolutely grateful to have had the opportunity to be a contributor for such a huge influential company like YP! I truly mean it when I say none of this could have been possible if it were not for all the support and encouragement you, my readers, have given me. Pink Tea Latte is as much yours as it is mine. The motivation to keep striving and publishing exciting excitement comes from all of you. I am excited and curious to see what the year ahead of me holds for Pink Tea Latte. I already have a couple of exciting things I will be sharing with you in the coming week so keep your eyes out for that! 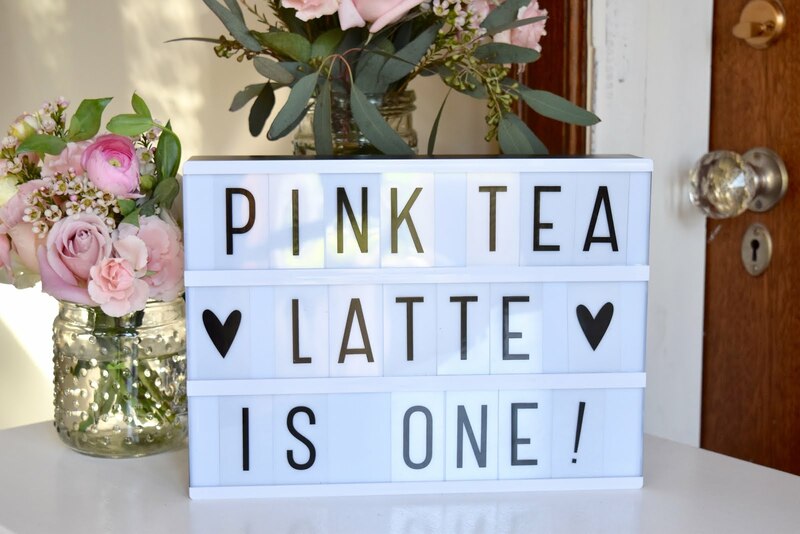 I also would love to hear in the comments below what posts have been your favourite and what more you would like to see on Pink Tea Latte in terms of content. Again, thank you thank you thank you! I love you all! sorry I have not been posting as often as I generally have in the past. What can I say, everyday in Vancouver as of late has been grey skys of rain and wind. I honestly just want some sunshine already. Also, the temperature has seemed to have dropped a bit. The grey sky and rain is making it impossible for me to take pictures. I have so many blog posts I want to publish, but they have no pictures to accompany the writing. Also, I am feeling a little down as of late. And I seem to not be the only one. The weather is affecting a lot of my friends and no one is feeling up for any adventures. Seasonal depression is very much real and affects many more then you realize. It is primarily during the winter months, the times when there is far less sunshine. This definitely is evident within Vancouver. At this point, we have been having constant rainy grey bleak days for months now and it is time for some sunshine. Vancouver's trees are currently full of cherry blossoms. They are gorgeous and beautiful and I cannot take enough pictures of them! I think my brain is so conflicted because the cherry blossoms are a sign of spring, more sunny days and warming temperatures. Also, day light savings began today. Our clocks moved forward 1 hour, but currently, the wind and rain are absolutely nutters outside. At one point this afternoon, I thought the roof of my house was going to get blown off! So let us all cross our fingers that sunshine and warmer days come to Vancouver soon because I do not know how many more rainy grey days I can take :( slash, I really want to start going on some outdoor hikes already!!! GAH! I wish brunch was an official meal everyday of the week and was not reserved only for the weekends and holidays. It is an excuse to have breakfast for lunch! I think breakfast food is probably one of my favourite meals. Perhaps it is the fact I can have sweets as a meal aka scrumptious waffles and pancakes and french toasts... YUM! For todays Sunday Brunch, I hit up Catch 122 Cafe Bistro for some delicious brunch goodness. Catch 122 does offer brunch everyday of the week (bonus points for them!) and hopefully more restaurants will adopt this logic and not reserve it for weekends only. This was my third time visiting Catch 122 and because I loved the truffle-scented mushrooms so darn much last time, I got it again today. It is really good. 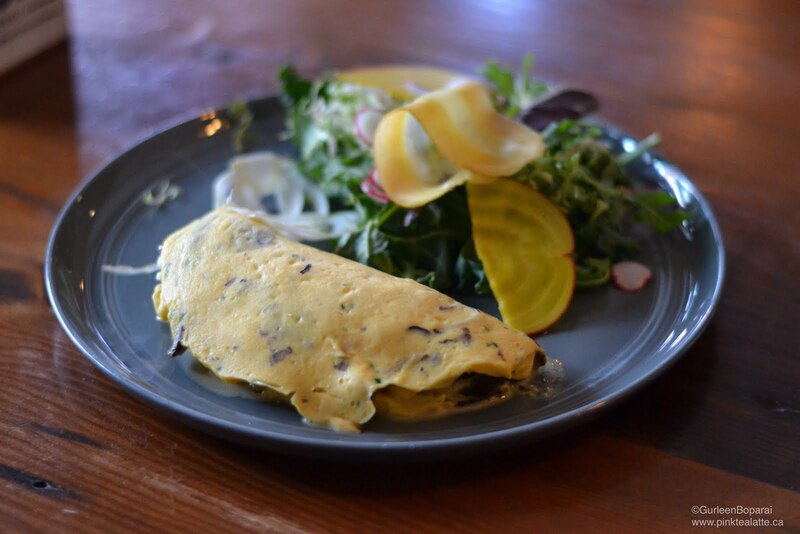 They use seasonal and wild cultivated mushrooms to fill the 3-egg omelette. But what really brings it over the top has to be the goat cheese. It adds creaminess as well as a bit of tang. Just delicious! And because I my eggs must always have ketchup, I did enjoy my omelette with ketchup hehe. I asked for a side salad in place of the Yukon Nugget Potato Hash as I generally do not like hash. I am not fond of mushy soft potato. As well, most restaurants give so much potato and I felt like I needed to get some greens into my body. However, if you keep reading, you will find out I regretted not getting Catch 122's hash. My friend had the Pulled Pork Breakfast Sandwich. It was picture perfect, hence the beautiful picture I was able to capture! It was thick meaty, Catch 122 is serious about making a good sandwich. 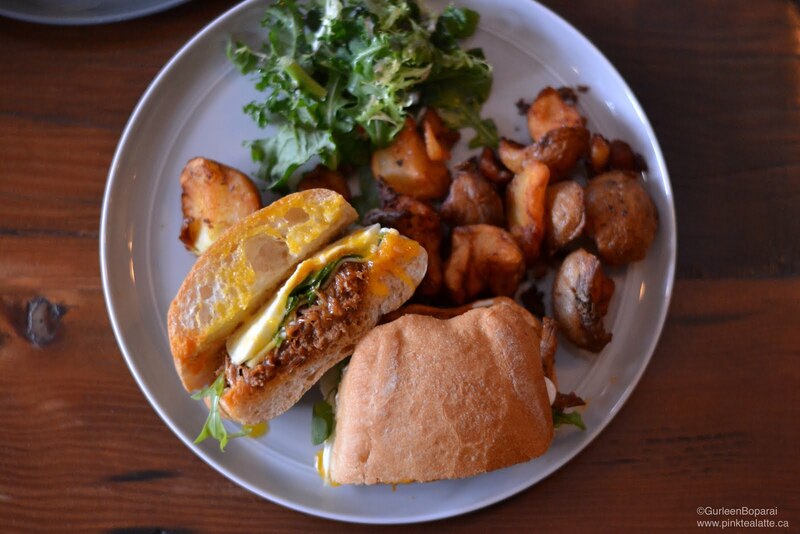 Sandwiched between a crispy ciabatta bread was tender pulled pork, a fried egg, creamy gruyere cheese finished with some crispy arugula. This sandwich will seriously fill you up! It came with a side of Catch 122's Golden Yukon Potato Hash and a small salad. I did sneak a few potatoes and they are super crispy. Nothing like any hash I have had before. These potatoes had a nice thick crispy outer shell holding in steamy soft potatoes. Probably the first time I have liked a potato hash! This was my Sunday Brunch for today! Do let me know if you think I need to give another dish on their menu a try. As well, any other places in Vancouver for amazing brunch as I am always on the lookout! Also, if you want to always be in the loop and get a sneak peek of what I am up to everyday, then follow my instagram @PinkTeaLatte as I post there first. The blog generally gets updated a day or two later. First impressions: I prefer the packaging design of series 1 because it was based off of the Latte character. Guess I am just a little biased! Also, I think the peachy pink colour does not fit in with "milk" and I understand that with each new series, companies like to give packaging a new fresh look. These ones were definitely glued shut better which is good! The one thing I do like about the new packaging is that one the side, they show the figures in full versus partial. In keeping with the first series package, I think it would have been cute if they put the Coconut Milk as the "have you seen me" picture because it is the chaser! I should have made an unboxing video, but I would not have had time until the weekend and only if there was sunshine out. So I decided against it and unboxed them on my own. You can watch my other tokidoki unboxing video - practically the screaming and concentration tongue were present. The two characters I got in my Moofia Series 2 blind boxes were MUSCLES and ALMONDINA!!!! HOW CUTE! I love how they made Muscles proportionally larger than Almondina because he is just so buff like that. Also loving his biceps hehe so cute! Plus he has bull horns as he is manly like that. Almondina is just adorable. I also like how they made her body match the containers almond milk comes in complete with the silver foil at the top. Plus cute little almond heart horns. Absolutely precious! I cannot wait to get more of the series 2 as I am still on the look out for the LATTE FIGURE! Absolutely unacceptable that I have not gotten Latte yet. We are meant to be, okay! Also, I want the little greek yogurt and peach yogurt. So cute! Let me know which character you are hoping to get in series 2! I know I have not done monthly goals in a while. I just had so much going on that I was falling behind on blog posts. 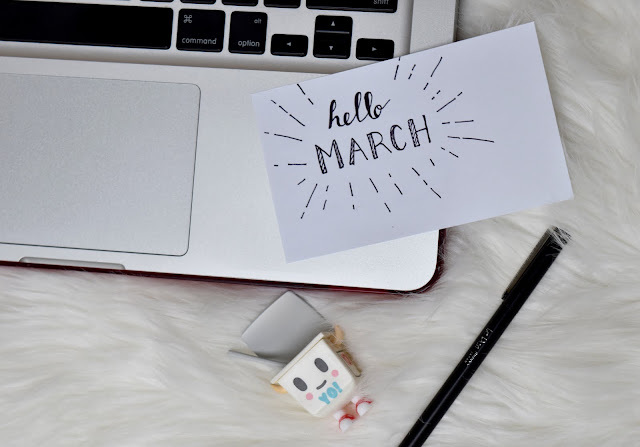 I finally am almost caught back up on my planned blog posts and finally was able to do my monthly goals list for you all! These are my goals. I hope it inspires you to set your own goals. As well, it is way to let you visualize what you want to achieve! 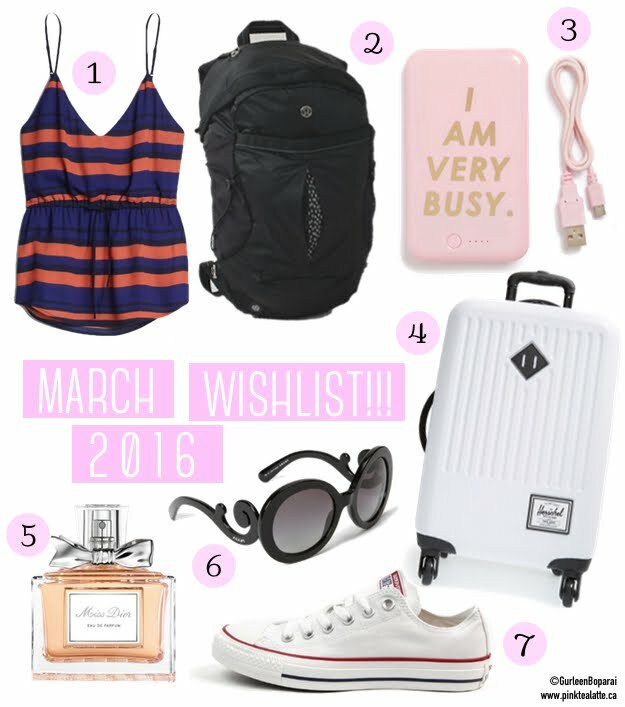 7 Lattes & Wishes | March 2016 Wishlist!!! We are now coming into spring and I am super excited! I think I am just done with the cold rainy Vancouver weather. You can dress very cute when it is cold; however, it has just been pouring rain in Vancouver for weeks. So I cannot wear my cute shoes and a cute coat because I need to wear rain boots and a rain jacket ... Super Boring! I am really loving floral and am wanting to grab some floral print tops. As well, I am hoping to pick up some distressed jeans. However, what I am in real need are some camisoles. I have gone from a B cup to a C cup in the last year and so my nice camisoles no longer fit. Major bummed, but that is okay because Aritzia always has got some really cute ones! I also think it is time to grab a new pair of sunglasses for the sunny days ahead! Hehe some fancy swirly Prada shades would be awesome. A total statement piece. And while I am at it, I think a new perfume too, some Miss Dior!!! Since the weather will finally be nice enough to do some outdoor exploring, I want to pick up a small backpack. The really tiny ones that are a quarter the size of a regular sized backpack. They are perfect for hikes and trails to fit your water bottle, cell phone, wallet and snacks. Lululemon is probably my favourite retailer when it comes to backpacks, I have two already and they are not only durable,but are also extremely comfortable with lots of pockets. For those who know me, they know about my weird aversion to feet. I do not like feet and I think toes are so weird! That is why I generally always wear closed toe shoes. 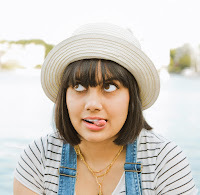 Last summer, I picked up a pair of Birkenstocks because I was like Gurleen, it is blisteringly hot out, your feet are suffocating in sneakers. They are really comfortable, but I still think my feet look weird in them.... haha so I want some more spring sneakers, like a pair of white converse. Lastly, I am hoping to go on a super exciting trip in a couple of months ( I do not want to say anything yet because I do not want to jinx it! ), so naturally, this girl needs a chic white Herschel carry on suitcase. Because no duh! And since I will be on a long flight, an external battery is always good to have on you. My cellphone is the Blackberry Classic and uses the micro USB cord (it is the same as all android phones); however, for some reason, all the cute external battery packs were for iPhones... Major Lame! But I eventually came across this super cute pink Ban.do charger hehe! Let me know what you think of my wishlist in the comments below and I also want to know what is on YOUR WISHLIST for March!